Mohammad Nazmul Hossain (born October 5, 1987) is a Bangladeshi cricketer. He was born in Habiganj, Bangladesh. 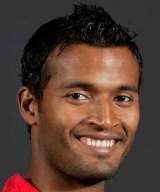 Hossain was part of the 13-man Bangladesh squad that played in the 2010 Asian Games in late November. They played against Afghanistan in the final and won by five wickets, securing the country's first gold medal at the Asian Games. He is currently playing in Asia Cup 2012.